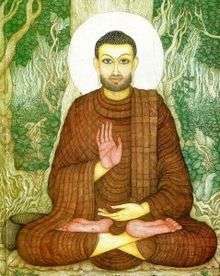 This article is about Mahākāśyapa, a disciple of Shakyamuni Buddha. 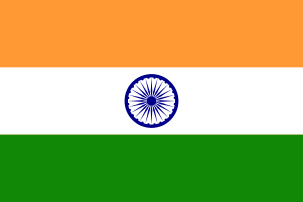 For more information on the Hindu sage Kashyapa, see Kashyapa. For information on the early Buddha, see Kassapa Buddha. Mahākāśyapa (Sanskrit; Pali: महाकस्सप Mahākassapa; Sinhala: මහා කාශ්‍යප මහ රහතන් වහන්සේ; Japanese: 摩訶迦葉 Maha Kasho or Makakashō; Chinese: 摩訶迦葉 móhējiāyè) or Kāśyapa was one of the principal disciples of Gautama Buddha and convened and directed the First Buddhist council. He came from the kingdom of Magadha. Mahākāśyapa is one of the most revered of the Buddha's entire disciples, foremost in ascetic practices. He is often depicted in statuary together with Ananda, each standing to one side of the Buddha. In Lotus Sutra Chapter 6 (Bestowal of Prophecy), the Buddha bestows prophecies of enlightenment on the disciples Mahakashyapa, Subhuti, Maha Katyayana, and Mahamaudgalyayana. 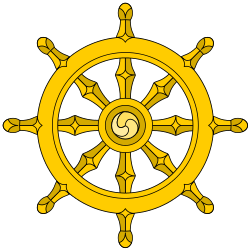 Thus, a way within Buddhism developed which concentrated on direct experience rather than on rational creeds or revealed scriptures. Zen is a method of meditative religion which seeks to enlighten people in the manner that Mahākāśyapa experienced. According to Chinese legend, the monk Ji Gong is a reincarnation of Mahākāśyapa (known as the Taming Dragon arhat). ↑ Suzuki, Daisetz (1961). Essays in Zen Buddhism. Grove Press. p. 60. ISBN 0802151183. ↑ "Dharma Transmission". Sweeping Zen. Retrieved June 7, 2012. ↑ Some oral lore traditions state it was a rare Udumbara flower of the Lotus Sutra. ↑ Chang, Chung-Yuan (1967). "Ch'an Buddhism: Logical and Illogical". ↑ Suzuki, Daisetz Teitaro (1948). Manual Of Zen Buddhism, 50. ↑ John S. Strong (2007). Relics of the Buddha. pp. 45–46. ↑ John S. Strong (2007). Relics of the Buddha. p. 220. ↑ Strong 2007, p. 227.